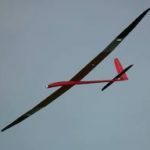 Well the nose of my Omega 2m glider was all but knocked off during the first electric glider competition on the 14th May. A heavy landing and the nose cracked all round. So to begin the repair I removed the speed controller and the receiver. The leads were then held out of position with elastic bands. The dirt and grass were removed from the cracks. Next I 'assembled' the broken parts together and used a drop of cyno' to hold it all together. Surprisingly it was very solid, not good enough to fly but it felt quite strong. To finish the repair I used a wing joining kit that includes epoxy resin and a strip of glass cloth. 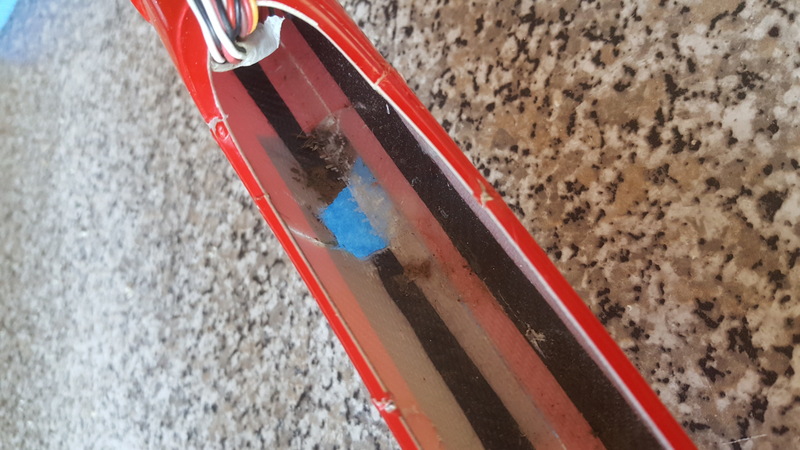 There was a small piece of the fuselage that did not come back from the field so I taped over the hole, about 10mm x 15mm, with masking tape. I cut 3 pieces of cloth to spread across the damaged are. Epoxy mixed I applied it to the inside of the fuz and laid the first piece of cloth inside. I then stippled the cloth to wet it out. I did this with the other two pieces. Having some epoxy left over I cut a fourth piece that went right around the fuz in one go, wetted it out as before. Now curing I am hoping the epoxy will fill the missing piece and the repair will be very strong. Once it has finished curing I will sand back any protrusions of expoy / cyno etc.. then rub down slightly and try to get a good paint match. I was pleased how easily it went so now I have no excuses in not repairing my Stork 8 glider. The repair on that is potentially even easier. 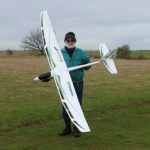 Looks a good job, you'll have to get down the field and try the glider out. Well the glider flew OK yesterday evening at our first summer meeting held on the field. Pity there were not more of us in attendance though. The weather cleared and the evening as warm with little breeze. Mike Jnr had an illuminated plane that looked impressive in the evening sky. Next month - Tuesday June 27th - Paul has promised to show us his BBQ skills. Might good to let him know if you are coming so he does not need to eat all the food! Here here, it was a very good evening, not too happy about getting nut of the month though 🙁 still a very good night and yes Jnr's night visionare did look very impressive. Hope to see more of our members next month.